The Zenith chubby scrubby boar sells for $36 plus shipping which I was eyeing for a while - till I lucked on this thread with a few left. A LE exclusively designed and good looking hand made boar brush at $50 is in my books a good deal ! 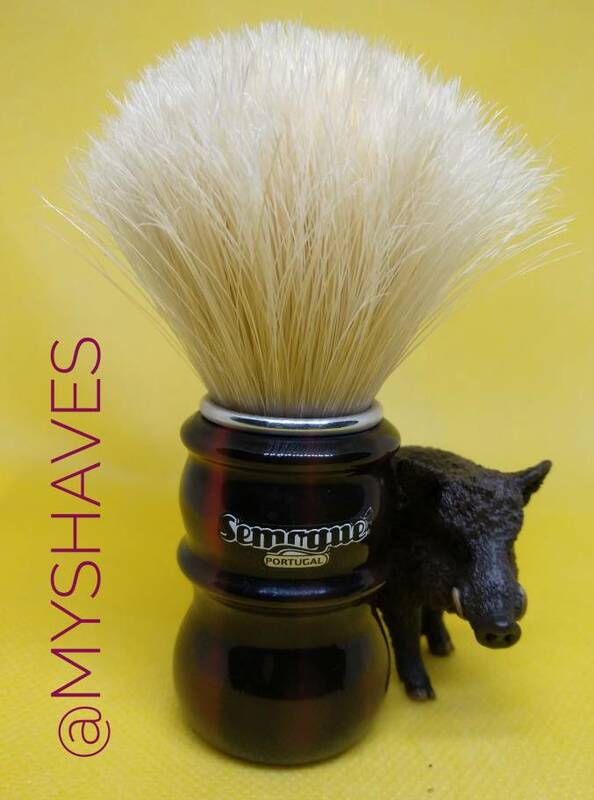 BTW can anyone owning both compare the Zenith 28mm chubby scrubby boar to this one ? After two uses, I can see why this brush is getting high marks. Although I loved the handle in my TSN LE Semogue 2-band, I had been holding off on this brush as I tend to like larger sized boar knots with a higher loft. I've been using the Thäter Premium Boar, an ABC Boar, and a Zenith with a similar knot as the ABC. As Teiste suggested, I soaked the brush for two days in cold water, and it was good to go with the first use, and didn't require a lengthy breaking in. The bristles are soft and it has a nice backbone for face lathering. I do wish it were a little larger, but that's only because I'm a fairly big guy with XXL sized hands, although the brush functions extremely well. Compared to my other premium boar brushes, the Semogue is easily the most beautiful, and the quality of the knot is just superb and is easily a notch above my other brushes. I thank Teiste for his excellent review, and Phil for offering this outstanding brush. 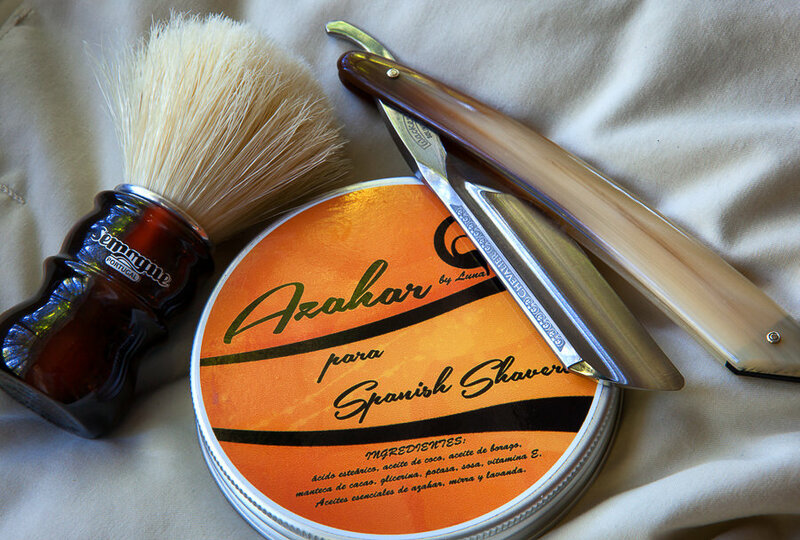 after using this brush for about a week and 4 shaves, I put my Thater Premium boar on the shelf. This brush has a really nice feel to it and the smaller knot I find perfect for face lathering, the only way I like to ride. the handle is super clean looking and reflects the light so well. We are down to the very last one. I have owned hundreds of boar brushes since I started shaving back in 1961. Boar was all I used until 2010 until I was presented with a Simpsons Duke II by a friend. Now my break-in is a little different than Teiste's but in the end I get the same results. I always start by soaking my boar brushes in warm water for at least 15 minutes before I start to lather. Boar unlike badger, actually soaks up the water in the bristle. I usually have a boar fully broken in within 4 shaves and this LE Semogue was no different. It has to be one of the best boar brushes that I have ever used. Now, my 15 minute warm water soak is not just for break-in, as I do this before every shave, no matter how old the brush is. Was this brush worth the money, in my opinion it was. I hope we get Semogue to do another one for us someday. IMHO, they make the best boar brushes, period. Just want to publicly thank both of you for enabling us boar users, and some badger cross overs, to be able to experience this finely made tool. (10-15-2018, 02:31 PM)Johnny Wrote: I have owned hundreds of boar brushes since I started shaving back in 1961. Boar was all I used until 2010 until I was presented with a Simpsons Duke II by a friend. Now my break-in is a little different than Teiste's but in the end I get the same results. I always start by soaking my boar brushes in warm water for at least 15 minutes before I start to lather. Boar unlike badger, actually soaks up the water in the bristle. I usually have a boar fully broken in within 4 shaves and this LE Semogue was no different. It has to be one of the best boar brushes that I have ever used. Now, my 15 minute warm water soak is not just for break-in, as I do this before every shave, no matter how old the brush is. It's already in the works for 2019. Mr Gomes is the real magician here and I hope the 2019 LEs would be as good as the two brushes offered this last 2018.Both the badger and the boar have been superb for their prices. I also have a project with Semogue for foroafeitado but that would take some time to develop. We can always be confident of your research and development and Mr. Gomes producing a high quality brush. I believe that, dollar-for-dollar, it is a great deal. We all appreciate your efforts. After use, I wrote to Vintage Scent to say how much I liked the brush. My brushing being marked 152/180, I thought that they might have around 28 left, but they wrote back to say that the numbers are sent out randomly and that this was one of the very last remaining. So if you're on the fence about this, it's probably now or never for deciding. Also, in response to my comment about an apparent difference in bloom, they remarked that these boar knots are "built differently than regular Semogues, thus you can notice a difference." I received mine yesterday, which I purchased after the reviews here. The first shave with it was great, and I expect it to get even better. I received mine last week and I am very satisfied. The knot is top notch and has nicely broken in after several uses. IMHO, the ergonomics of the SOC handle is better than this one (better for larger hands). I love the appearance and the knot, but I hope the 2019 version has a larger handle. Any idea when this brush might be available again? Wow, I'm sorry I missed out on this one. Stunning. I consider myself fortunate indeed to possess one of these fine boar brushes. I have the other high end boars to compare it to, which are excellent brushes also. This brush however stands alone at the top, the build quality is simply stunning. I love my Omega 10083 that cost a grand total of $10 shipped and was broken in by someone else.